Various mutations in the SH3 and multiple ankyrin repeat domains 3 (SHANK3) gene are associated with neurodevelopmental and neuropsychiatric disorders. Thus far, synaptic abnormalities in multiple brain regions, including the hippocampus, prefrontal cortex, striatum, and ventral tegmental area, have been investigated in several lines of Shank3 mutant mice. However, although some reports have shown loss and gain of body weight in Shank3 knock-out and overexpressing transgenic (TG) mice, respectively, the potential functions of Shank3 in the hypothalamus, a brain region critically involved in energy intake and expenditure, are unknown. Hence, we first characterized endogenous Shank3 mRNA and protein expression in the hypothalamus of adult wild-type mice. Thereafter, we performed transcriptome analysis (RNA-sequencing) in the hypothalamus of adult Shank3 TG mice which mildly overexpress Shank3 proteins. By comparing the 174 differentially expressed genes in the hypothalamus with those previously reported in the striatum and medial prefrontal cortex (mPFC) of Shank3 TG mice, we found that 159 were hypothalamus-specific while only 15 were also observed in either the striatum or mPFC. Furthermore, gene set enrichment analysis of the RNA-sequencing analysis revealed that ribosome-related genes were enriched especially in the up-regulated genes of Shank3 TG hypothalamus, which is in contrast to the results of the Shank3 TG striatum and mPFC analyses, where ribosome-related genes were enriched in the down-regulated genes. Beyond revealing endogenous Shank3 mRNA and protein expression in the hypothalamus, our results suggest unique molecular changes in the hypothalamus of Shank3 TG mice compared with those in the striatum and mPFC. Deletions, duplications, and point mutations in the SH3 and multiple ankyrin repeat domains 3 (SHANK3) gene, encoding excitatory postsynaptic core scaffolding proteins, are causally associated with numerous neurodevelopmental and neuropsychiatric disorders. Several mouse lines of knock-out, knock-in, overexpression, and viral knock-down for the Shank3 gene have been generated and characterized, which has provided important insights into the neuronal pathophysiology of SHANK3-associated brain disorders. Specifically, detailed biochemical and synaptic abnormalities in various brain regions of the mice, including the prefrontal cortex [1–3], hippocampus [4–6], striatum [7–10], and ventral tegmental area , have been investigated. The hypothalamus is a brain region critical for regulating energy intake and expenditure . Notably, reduced body weight of a line of Shank3 knock-out mice was reported . Moreover, Shank3 transgenic (Shank3 TG) mice which mildly overexpress Shank3 proteins (by approximately 50%) showed increased body weight and food intake . Therefore, it is conceivable that Shank3 may have some functions in the hypothalamus; however, this has not been investigated thus far. In the present study, we aimed to understand expression and molecular functions of Shank3 in the hypothalamus, by performing transcriptome (RNA-sequencing, RNA-seq) analysis in the hypothalamus of adult (10 to 12-week old) Shank3 TG mice (Additional file 1). We initially characterized the expression of endogenous Shank3 mRNA and protein in the hypothalamus because there was a report suggesting a lack of Shank3 expression in the hypothalamus . In qRT-PCR experiments using primers targeting exon 6–7 of Shank3 (thus detecting Shank3a and Shank3b isoforms), Shank3 mRNA levels in the hypothalamus were relatively lower than those in the cortex, medial prefrontal cortex (mPFC), hippocampus, and striatum, but higher than those in the cerebellum of adult male wild-type (WT) mice (Fig. 1a). Consistent with the mRNA expression pattern, protein levels of Shank3 and its direct binding partner Homer1b/c in the hypothalamus were relatively lower than those in other brain regions of adult male WT mice (Fig. 1b). Based on the expression of endogenous Shank3 in the hypothalamus, we next investigated molecular changes in the hypothalamus of Shank3 TG mice by performing a RNA-seq analysis of hypothalamic tissue from adult male WT and Shank3 TG mice (Additional file 2: Table 1). After applying adjusted P values (< 0.05, Benjamini–Hochberg correction) to the transcriptome analysis, we identified 174 differentially expressed genes (DEGs) (79 up-regulated and 95 down-regulated) in the Shank3 TG hypothalamus compared with the WT hypothalamus (Fig. 1c and Additional file 2: Table 2). Thereafter, we attempted to understand the specificity of the Shank3 TG hypothalamic DEGs, by comparing them to DEGs from two age-matched Shank3 TG RNA-seq studies recently published by our group. One was from the striatum (75 DEGs; 33 up-regulated and 42 down-regulated) , and the other was from the medial prefrontal cortex (mPFC) (195 DEGs; 82 up-regulated and 113 down-regulated) of adult Shank3 TG mice . We observed that the majority of DEGs found in each brain region were brain region-specific (Fig. 1d). Specifically, among the 174 DEGs of the Shank3 TG hypothalamus, 159 were hypothalamus-specific while only 15 were shared with either the striatum or mPFC. Notably, five genes were commonly altered in all three brain regions of Shank3 TG mice compared with those of the WT mice (Fig. 1d), among which we validated the changes of Shank3, G protein-coupled receptor 85 (Gpr85), and Caveolin 2 (Cav2) in the Shank3 TG hypothalamus by qRT-PCR experiments (Fig. 1d, left panel). To understand representative biological pathways or functions of the 174 DEGs in the Shank3 TG hypothalamus, we performed Gene Ontology (GO) and Kyoto Encyclopedia of Genes and Genomes (KEGG) pathway analyses. However, we could not find significant terms in any category of the analyses, suggesting that the 174 DEGs may be too heterogeneous to be grouped into certain biological pathways or functions. Therefore, instead of focusing on the DEGs, we next performed gene set enrichment analysis (GSEA) of the RNA-seq analysis. GSEA is more useful to identify meaningful molecular signatures based on broader or overall expression changes in the transcriptome, regardless of fold change and statistical significance of each gene [14, 15]. We applied three different groups of gene sets (Hallmark, KEGG, and GO gene sets) to the hypothalamic RNA-seq analysis. For the Hallmark gene sets, “Epithelial mesenchymal transition” was significantly represented by the up-regulated genes of the Shank3 TG hypothalamus (Additional file 2: Table 3). For the KEGG gene sets, “Ribosome” and “ECM receptor interaction” were enriched by the up-regulated genes of the Shank3 TG hypothalamus (Fig. 1e, g and Additional file 2: Table 3). Lastly, for the GO gene sets, “Cytosolic ribosome” and “Ribosomal subunit” were enriched by the up-regulated genes, while “Postsynapse” and “Synaptic membrane” were represented by the down-regulated genes of the Shank3 TG hypothalamus (Fig. 1f and Additional file 2: Table 3). 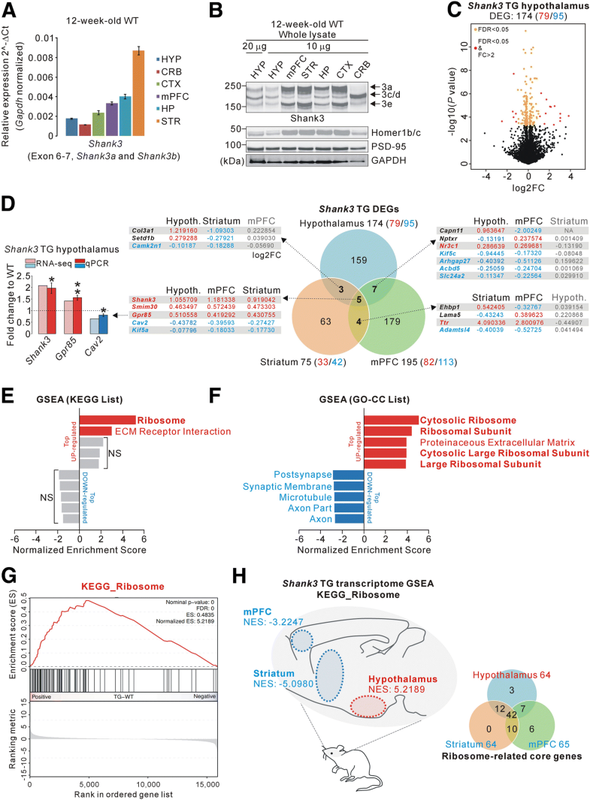 Collectively, these results indicate that ribosome-related genes are enriched especially in the up-regulated genes of the Shank3 TG hypothalamus, which is reminiscent of our previous GSEA of the RNA-seq analyses of the striatum and mPFC of Shank3 TG mice [14, 15]. Notably, however, in the striatum and mPFC of Shank3 TG mice, ribosome-related genes were enriched in the down-regulated genes, but not in the up-regulated genes (Fig. 1h). Nevertheless, the ribosome-related core genes largely overlapped in all three brain regions (Fig. 1h, right panel and Additional file 2: Table 4), suggesting opposite directional changes of those genes in the hypothalamus compared with the striatum and mPFC of Shank3 TG mice. Nevertheless, it should be considered that the ribosome-related genes in the Shank3 TG hypothalamus were not DEGs. Therefore, we consider that the GSEA results may reflect some, possibly ribosome-related, functional changes in the Shank3 TG hypothalamus which may lead to subtle, but overall, responses of ribosome-related genes. Our results show mRNA and protein expressions of Shank3 in the hypothalamus, and the effect of mild Shank3 overexpression on hypothalamic gene expression, thus providing a new platform to further investigate unique molecular and synaptic functions of Shank3 in the hypothalamus. Chunmei Jin and Hyojin Kang contributed equally to this work. This work was supported by the National Research Foundation of Korea (NRF) grants funded by the Korea Government Ministry of Science and ICT (NRF-2015M3C7A1028790, NRF-2018R1C1B6001235 and NRF-2018M3C7A1024603), by the Korea Institute of Science and Technology Information (K-18-L12-C08-S01), and by Korea University Future Research Grant (K1824021). The datasets used and analyzed in the current study are available from the corresponding author on reasonable request. RNA-seq raw data were submitted to the GEO (Gene Expression Omnibus) repository under accession number GSE120609. CJ, SK, YZ, YL, YK and KH designed and performed the experiments. HK and KH analyzed and interpreted the data. KH wrote the paper. All authors read and approved the manuscript. The WT and Shank3 TG mice were bred and maintained in a C57BL/6 J background according to the Korea University College of Medicine Research Requirements, and all the experimental procedures were approved by the Committees on Animal Research at the Korea University College of Medicine (KOREA-2016-0096).